PCOS is hormonal disorder where there are irregular periods, excessive hair growth on face or body (“hirsutism”), loss of hair on head, oily skin, acne and weight gain along with polycystic ovaries found in ultrasound. Polycystic ovaries have more number of follicles (fluid-filled spaces containing the eggs), which appear like cysts. However, the “cysts” in PCOS are not tumours. The main problem in PCOS is not the “cysts”, rather cysts are arising because of hormonal problems. Presence of polycystic ovaries does not always mean PCOS. It is a quite common condition, affecting 2 to 26 in every 100 women. The exact cause of PCOS is not yet known but it often runs in families. 2.Insulin is a hormone that controls the level of glucose (a type of sugar) in the blood. If you have PCOS, your body may not respond to insulin (“insulin resistance”), so the level of glucose is higher. To try to prevent the glucose levels becoming higher, your body produces even more insulin. High levels of insulin can lead to weight gain, irregular periods, fertility problems and higher levels of testosterone. Is PCOS related to other diseases? Effect of PCOS is not limited to the ovaries. Women with PCOS are more prone to develop diabetes, high blood pressure, heart disease, stroke, depression and mood swings, snoring and daytime drowsiness and sometimes, cancer in the lining of the uterus (endometrium). The risks are higher for obese women. How PCOS is related to the infertility? 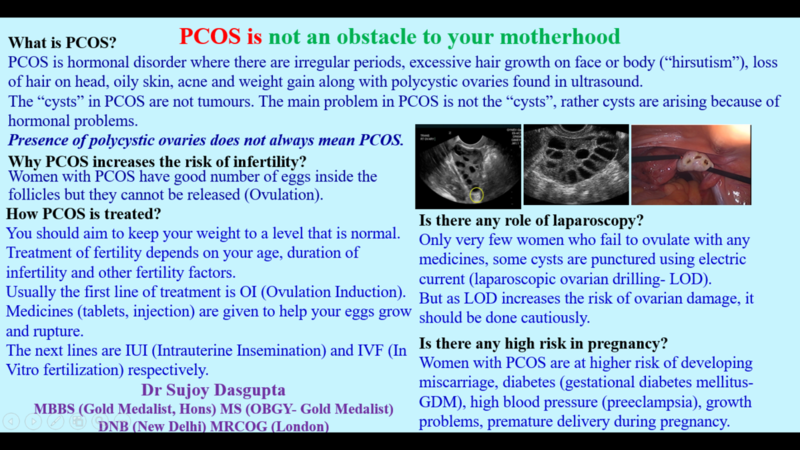 Women with PCOS have good number of eggs inside the follicles but they cannot be released (Ovulation). As a result, sperms cannot meet the eggs, leading to infertility. Additionally, obesity, diabetes, high testosterone and insulin level all can be risk factors for infertility. Unfortunately, there is no cure for PCOS. However, it can be kept under control. Majority of the women can keep the disease under control with lifestyle changes (diet and exercise), rather than medicines. These can also help to prevent the long-term consequences. You should aim to keep your weight to a level that is normal. Losing only a small portion of weight will improve regularity of your periods, ovulation and also the chance of pregnancy. Some women are prescribed “Insulin sensitizers” like inositol and metformin. Treatment of fertility depends on your age, duration of infertility and other fertility factors. Usually the first line of treatment is OI (Ovulation Induction). The next lines are IUI (Intrauterine Insemination) and IVF (In Vitro fertilization) respectively. Medicines (tablets, injection) are given to help your eggs grow and rupture. In the first cycle, it is important to see (by ultrasound) whether eggs are growing or not. If the eggs rupture, the chance of pregnancy per cycle is 15% and after 4-6 cycles of OI, it is nearly 50-60%. That means, out of 100 women who had ovulation, 15 can conceive after one month. IUI is one step ahead of OI. Here along with medicines given for OI, husband’s sperm is collected, processed (“preparation”) and then inserted inside the uterus. The success rate is 15-20% per cycle. If a woman fails to conceive after 4-6 cycles of IUI, if the age is on higher side, there is long duration of infertility or additional problems like sperm defects or tubal blocks, IVF is advised. The success rate is 40-50% per cycle. But caution should be taken as these women are at risk of developing OHSS (Ovarian hyperstimulation syndrome- excessive response by ovaries) and twin pregnancy. Frozen embryo transfer reduces the risk. Is there any role of laparoscopy? Only very few women who fail to ovulate with any medicines, sometimes laparoscopy is done where some cysts are punctured using electric current (laparoscopic ovarian drilling- LOD). Additionally, LOD can be done for women requiring laparoscopy for other purposes (like pain, testing the tubes). However, LOD carries risk of ovarian damage and therefore, should be done in selective patients. Is any special precaution required in pregnancy? Women with PCOS are at higher risk of developing miscarriage, diabetes (gestational diabetes mellitus- GDM), high blood pressure (preeclampsia), growth problems, premature delivery during pregnancy. Therefore, screening for GDM should be done along with regular scan under specialist supervision throughout pregnancy. PCOS is common but majority of the women can do well with life style changes. The chance of pregnancy after treatment is higher for women with PCOS than for other women. Proper care should be taken before and during pregnancy.